They don't weigh much and they're not heavy on the old stomach. They're also incredibly addictive and downright delicious. Meringues are so special because they are relatively simple to make and they disappear on the tongue like cotton candy. 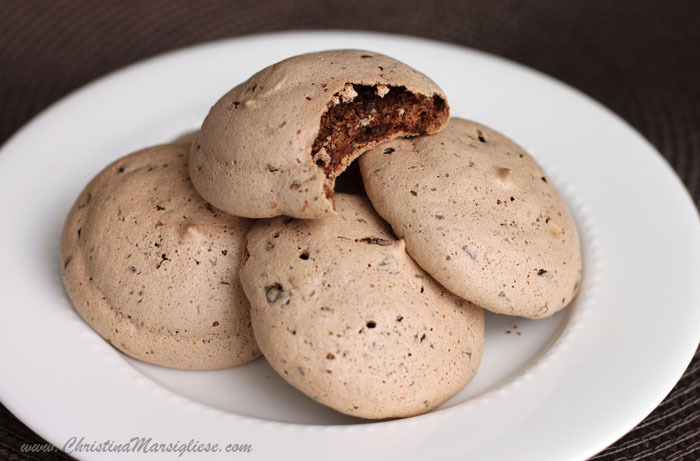 These are called Marshmallow Meringues because that's exactly what they are - chocolate marshmallow to boot! I'm not kidding. The outside is crisp and crumbly and the center is moist, dense and spongy just like marshmallow! It's a major wow moment when you eat these, and don't be surprised when 8 have gone down like water. Now, there's a trick to creating the marshmallow texture. 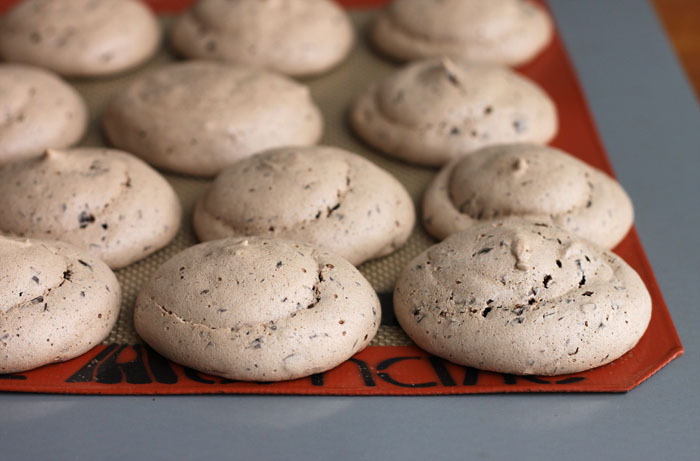 If you've ever made meringue before, then you'd know it's essentially a sweetened egg white foam. Typical recipes say to beat egg whites with a pinch of cream of tartar until they form soft peaks and then slowly beat in the sugar until they reach stiff peaks. This is lovely. It makes for really nice crisp meringue. For a moist spongy center, the key is to begin adding the sugar almost right from the start. I beat the whites just until they are foamy and then slowly beat in the sugar. The mixture will look soupy from doing this and it will take you longer to beat them to stiff peaks, but once you reach the proper volume the mixture will look like shaving cream - a thick dense foam. This foam is very fine-textured and very stable. Sugar holds onto the water so tightly and keeps the centers moist. The higher than normal baking temperature and shorter than normal baking time will help to create a crisp top while keeping the middle marshmallowy, but it will also make them a bit hollow. The center will shrink during cooling, but it just adds to the fun. When eaten fresh these will crumble quite a bit, but after a day of storage in an airtight container they develop integrity and hold up to your biting teeth. PS. the addition of cornstarch also helps to bind water and set the texture. Oh ya...and there are bits of dark chocolate all up inside them! Bonus. Preheat your oven to 300 degrees F. Line a large baking sheet with a silicone mat. Add egg whites, cream of tartar and salt to a medium clean, dry bowl and beat on medium speed until foamy, about 25 seconds. While beating, gradually add the granulated sugar, one tablespoon at a time. This will take a minute or two of beating. Increase speed to medium-high and continue to beat until stiff, glossy peaks form, about 2-3 minutes. The egg whites will be white, thick and foamy, like shaving cream. Sift in cocoa and corn starch and beat on low speed until combined. Beat in vanilla. Fold in chocolate. Pipe 2-inch-wide rounds onto prepared baking sheet and bake for 25-30 minutes. Let cool completely before removing from silicone mat. Delicious! What an amazing cookie for guests too! Great tip for changing up the traditional meringue. I might actually like these, I'm not a meringue fan. Mmm, these looks so perfectly soft at the center :) Never made marshmallow meringues, and normally don't like marshmallows, but this I think I'll have to give a try! Gorgeous!! Such beautiful cookies, loved this recipe!! Your book came today. Outstanding photography, great science based baking information and excellent recipes. Love it. Yay! Thank you! I'm so happy you like it! I just found your blog via Pinterest, and I am hooked! I'm a science-y type (chemistry degree), and I love your technical approach to baking. I'm glad you found me! Je découvre votre blogue grâce à une amie blogueuse et j'en suis ravie. 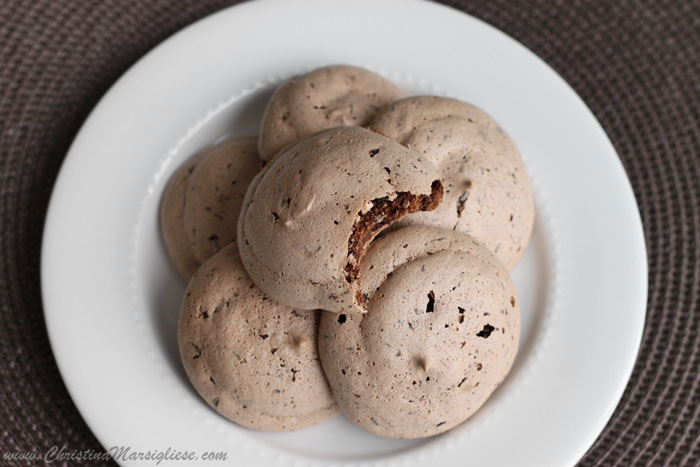 Ayant moi-même un blogue de cuisine sans gluten, je vais m'empresser de faire ces jolies petites meringues et publierai la recette en mentionnant qu'elle est de vous. Merci et au plaisir! Made these last night and they are good as they look. I'm trying to hold the line and not eat another one for at least 45 minutes, but I'm not sure if I'll get there. But if they were already broken, that counts as cleaning the counter, not eating a cookie, right? i have such a problem making meringues. i'm really impressed. i can honestly tell you that these are the most appealing meringues i've ever seen! Love these! Great way to use up egg whites and since there is chocolate in them my boys will just gobble them up! I googled about the different language usage of corn starch between American and British and found out that in American language, it means corn flour in British. Is this true? If not what kind of corn starch do you use then? Thank you! Hi there! Yes, corn flour in Britain/Australia is equivalent to corn starch in North America.